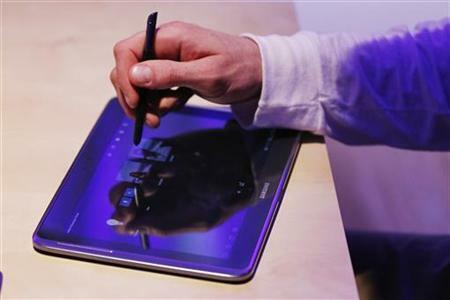 Samsung Electronics launched its new Galaxy Note tablet in three major markets on Thursday, hoping that a stylus-type pen and split-screen function will stand the new device apart from rival Apple Inc's iPad. The company, facing accusations that it copied the design and some features of Apple's iPad and iPhone, said the Galaxy Note 10.1 would be a "game changer" from rival tablets, on which users usually only view one application at a time. The device can have two apps active on a split-screen, while an 'S-Pen' seeks to solve tablet and smart-phones' sometimes clunky keyboard and input functions by allowing users to write and sketch on the screen. Analysts, however, were sceptical of its ability to make inroads into Apple's huge lead in the tablet market given plans to price it at $499 for 16 gigabytes of memory and WiFi-only - the same as the iPad. "When you look at the price and overall consumer awareness about Samsung tablets, it's not likely to be a big success," said Park Young, an analyst at Woori Investment & Securities in Seoul. "Tablets are getting cheaper and even Apple is rumoured to be preparing a cheaper iPad. Consumers also tend not to spend much on tablets any more as smartphones can do most of the entertainment functions that tablets offer." Marc Chacksfield, deputy editor at British tech website TechRadar, said that, while the new tablet had some positive features, it felt cheaper in the hand than the iPad and might not win buyers over if priced similarly to the Apple product. "Couple this with an influx of low-priced Android tablets entering the market (headed up by the Google (GOOG.O) Nexus 7) and Samsung may struggle to compete," he said in an email to Reuters.